Aldous Leonard Huxley (26 July 1894 – 22 November 1963) was an English writer and philosopher. He authored nearly fifty books—both novels and non-fiction works—as well as wide-ranging essays, narratives, and poems. Born into the prominent Huxley family, he graduated from Balliol College with an undergraduate degree in English literature. Early in his career, he published short stories and poetry and edited the literary magazine Oxford Poetry, before going on to publish travel writing, satire, and screenplays. He spent the latter part of his life in the United States, living in Los Angeles from 1937 until his death. By the end of his life, Huxley was widely acknowledged as one of the foremost intellectuals of his time. He was nominated for the Nobel Prize in Literature seven times and was elected Companion of Literature by the Royal Society of Literature in 1962. Huxley was a humanist and pacifist. He grew interested in philosophical mysticism and universalism, addressing these subjects with works such as The Perennial Philosophy (1945)—which illustrates commonalities between Western and Eastern mysticism—and The Doors of Perception (1954)—which interprets his own psychedelic experience with mescaline. In his most famous novel Brave New World (1932) and his final novel Island (1962), he presented his vision of dystopia and utopia, respectively. Huxley was born in Godalming, Surrey, England, in 1894. He was the third son of the writer and schoolmaster Leonard Huxley, who edited Cornhill Magazine, and his first wife, Julia Arnold, who founded Prior's Field School. Julia was the niece of poet and critic Matthew Arnold and the sister of Mrs. Humphry Ward. Aldous was the grandson of Thomas Henry Huxley, the zoologist, agnostic, and controversialist ("Darwin's Bulldog"). His brother Julian Huxley and half-brother Andrew Huxley also became outstanding biologists. 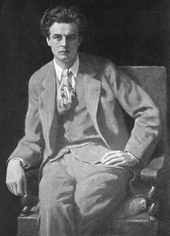 Aldous had another brother, Noel Trevelyan Huxley (1891–1914), who committed suicide after a period of clinical depression. As a child, Huxley's nickname was "Ogie", short for "Ogre". He was described by his brother, Julian, as someone who frequently "[contemplated] the strangeness of things". According to his cousin and contemporary, Gervas Huxley, he had an early interest in drawing. Following his years at Balliol, Huxley, being financially indebted to his father, decided to find employment. He taught French for a year at Eton College, where Eric Blair (who was to take the pen name George Orwell) and Steven Runciman were among his pupils. He was mainly remembered as being an incompetent schoolmaster unable to keep order in class. Nevertheless, Blair and others spoke highly of his excellent command of language. Significantly, Huxley also worked for a time during the 1920s at Brunner and Mond, an advanced chemical plant in Billingham in County Durham, northeast England. According to the introduction to the latest edition of his science fiction novel Brave New World (1932), the experience he had there of "an ordered universe in a world of planless incoherence" was an important source for the novel. Huxley completed his first (unpublished) novel at the age of 17 and began writing seriously in his early twenties, establishing himself as a successful writer and social satirist. His first published novels were social satires, Crome Yellow (1921), Antic Hay (1923), Those Barren Leaves (1925), and Point Counter Point (1928). Brave New World was his fifth novel and first dystopian work. In the 1920s he was also a contributor to Vanity Fair and British Vogue magazines. During the First World War, Huxley spent much of his time at Garsington Manor near Oxford, home of Lady Ottoline Morrell, working as a farm labourer. There he met several Bloomsbury Group figures, including Bertrand Russell, Alfred North Whitehead, and Clive Bell. Later, in Crome Yellow (1921) he caricatured the Garsington lifestyle. Jobs were very scarce, but in 1919 John Middleton Murry was reorganising the Athenaeum and invited Huxley to join the staff. He accepted immediately, and quickly married the Belgian refugee Maria Nys, also at Garsington. They lived with their young son in Italy part of the time during the 1920s, where Huxley would visit his friend D. H. Lawrence. Following Lawrence's death in 1930, Huxley edited Lawrence's letters (1932). Works of this period included important novels on the dehumanising aspects of scientific progress, most famously Brave New World, and on pacifist themes (for example, Eyeless in Gaza). In Brave New World, set in a dystopian London, Huxley portrays a society operating on the principles of mass production and Pavlovian conditioning. Huxley was strongly influenced by F. Matthias Alexander, and included him as a character in Eyeless in Gaza. Beginning in this period, Huxley began to write and edit non-fiction works on pacifist issues, including Ends and Means, An Encyclopedia of Pacifism, and Pacifism and Philosophy, and was an active member of the Peace Pledge Union. In 1937 Huxley moved to Hollywood with his wife Maria, son Matthew Huxley, and friend Gerald Heard. He lived in the U.S., mainly in southern California, until his death, and also for a time in Taos, New Mexico, where he wrote Ends and Means (published in 1937). The book contains tracts on war, religion, nationalism and ethics. Heard introduced Huxley to Vedanta (Upanishad-centered philosophy), meditation, and vegetarianism through the principle of ahimsa. In 1938, Huxley befriended Jiddu Krishnamurti, whose teachings he greatly admired. Huxley and Krishnamurti entered into an enduring exchange (sometimes edging on debate) over many years, with Krishnamurti representing the more rarefied, detached, ivory-tower perspective and Huxley, with his pragmatic concerns, the more socially and historically informed position. Huxley provided an introduction to Krishnamurti's quintessential statement, The First and Last Freedom (1954). Huxley also became a Vedantist in the circle of Hindu Swami Prabhavananda, and introduced Christopher Isherwood to this circle. Not long afterward, Huxley wrote his book on widely held spiritual values and ideas, The Perennial Philosophy, which discussed the teachings of renowned mystics of the world. Huxley's book affirmed a sensibility that insists there are realities beyond the generally accepted "five senses" and that there is genuine meaning for humans beyond both sensual satisfactions and sentimentalities. Huxley became a close friend of Remsen Bird, president of Occidental College. He spent much time at the college, which is in the Eagle Rock neighbourhood of Los Angeles. The college appears as "Tarzana College" in his satirical novel After Many a Summer (1939). The novel won Huxley a British literary award, the 1939 James Tait Black Memorial Prize for fiction. Huxley also incorporated Bird into the novel. During this period, Huxley earned a substantial income as a Hollywood screenwriter; Christopher Isherwood, in his autobiography My Guru and His Disciple, states that Huxley earned more than $3,000 per week (an enormous sum in those days) as a screenwriter, and that he used much of it to transport Jewish and left-wing writer and artist refugees from Hitler's Germany to the US. In March 1938, Huxley's friend Anita Loos, a novelist and screenwriter, put him in touch with Metro-Goldwyn-Mayer (MGM), which hired him for Madame Curie which was originally to star Greta Garbo and be directed by George Cukor. (Eventually, the film was completed by MGM in 1943 with a different director and cast.) Huxley received screen credit for Pride and Prejudice (1940) and was paid for his work on a number of other films, including Jane Eyre (1944). He was commissioned by Walt Disney in 1945 to write a script based on Alice's Adventures in Wonderland and the biography of the story's author, Lewis Carroll. The script was not used, however. Huxley wrote an introduction to the posthumous publication of J. D. Unwin's 1940 book Hopousia or The Sexual and Economic Foundations of a New Society. Within the next generation I believe that the world's leaders will discover that infant conditioning and narcohypnosis are more efficient, as instruments of government, than clubs and prisons, and that the lust for power can be just as completely satisfied by suggesting people into loving their servitude as by flogging them and kicking them into obedience. Huxley had deeply felt apprehensions about the future the developed world might make for itself. From these, he made some warnings in his writings and talks. In a 1958 televised interview conducted by journalist Mike Wallace, Huxley outlined several major concerns: the difficulties and dangers of world overpopulation; the tendency toward distinctly hierarchical social organisation; the crucial importance of evaluating the use of technology in mass societies susceptible to persuasion; the tendency to promote modern politicians to a naive public as well-marketed commodities. In 1953, Huxley and Maria applied for United States citizenship and presented themselves for examination. When Huxley refused to bear arms for the U.S. and would not state that his objections were based on religious ideals, the only excuse allowed under the McCarran Act, the judge had to adjourn the proceedings. He withdrew his application. Nevertheless, he remained in the U.S. In 1959 Huxley turned down an offer of a Knight Bachelor by the Macmillan government without putting forward a reason; his brother Julian had been knighted in 1958, while another brother Andrew would be knighted in 1974. Beginning in 1939 and continuing until his death in 1963, Huxley had an extensive association with the Vedanta Society of Southern California, founded and headed by Swami Prabhavananda. Together with Gerald Heard, Christopher Isherwood and other followers, he was initiated by the Swami and was taught meditation and spiritual practices. In 1944, Huxley wrote the introduction to the "Bhagavad Gita: The Song of God", translated by Swami Prabhavananda and Christopher Isherwood, which was published by the Vedanta Society of Southern California. From 1941 until 1960, Huxley contributed 48 articles to Vedanta and the West, published by the society. He also served on the editorial board with Isherwood, Heard, and playwright John Van Druten from 1951 through 1962. Huxley also occasionally lectured at the Hollywood and Santa Barbara Vedanta temples. Two of those lectures have been released on CD: Knowledge and Understanding and Who Are We? from 1955. Nonetheless, Huxley's agnosticism, together with his speculative propensity, made it difficult for him to fully embrace any form of institutionalised religion. In the spring of 1953, Huxley had his first experience with the psychedelic drug mescaline. Huxley had initiated a correspondence with Doctor Humphry Osmond, a British psychiatrist then employed in a Canadian institution, and eventually asked him to supply a dose of mescaline; Osmond obliged and supervised Huxley's session in southern California. After the publication of The Doors of Perception, in which he recounted this experience, Huxley and Swami Prabhavananda disagreed about the meaning and importance of the psychedelic drug experience, which may have caused the relationship to cool, but Huxley continued to write articles for the society's journal, lecture at the temple, and attend social functions. Huxley later had an experience on LSD that he considered more profound than those detailed in The Doors of Perception. Huxley wrote that "The mystical experience is doubly valuable; it is valuable because it gives the experiencer a better understanding of himself and the world and because it may help him to lead a less self-centered and more creative life." Differing accounts exist about the details of the quality of Huxley's eyesight at specific points in his life. In about 1939 Huxley encountered the Bates method for better eyesight, and a teacher, Margaret Darst Corbett, who was able to teach the method to him. In 1940, Huxley relocated from Hollywood to a 40-acre (16 ha) ranchito in the high desert hamlet of Llano, California, in northern Los Angeles County. Huxley then said that his sight improved dramatically with the Bates Method and the extreme and pure natural lighting of the southwestern American desert. He reported that, for the first time in more than 25 years, he was able to read without glasses and without strain. He even tried driving a car along the dirt road beside the ranch. He wrote a book about his successes with the Bates Method, The Art of Seeing, which was published in 1942 (U.S.), 1943 (UK). The book contained some generally disputed theories, and its publication created a growing degree of popular controversy about Huxley's eyesight. It was, and is, widely believed that Huxley was nearly blind since the illness in his teens, despite the partial recovery that had enabled him to study at Oxford. For example, some ten years after publication of The Art of Seeing, in 1952, Bennett Cerf was present when Huxley spoke at a Hollywood banquet, wearing no glasses and apparently reading his paper from the lectern without difficulty: "Then suddenly he faltered—and the disturbing truth became obvious. He wasn't reading his address at all. He had learned it by heart. To refresh his memory he brought the paper closer and closer to his eyes. When it was only an inch or so away he still couldn't read it, and had to fish for a magnifying glass in his pocket to make the typing visible to him. It was an agonising moment." Brazilian author João Ubaldo Ribeiro, who as a young journalist spent several evenings in the Huxleys' company in the late 1950s, wrote that Huxley had said to him, with a wry smile: "I can hardly see at all. And I don't give a damn, really." Ribeiro then proceeds to confirm Bennett Cerf's experience, as described above. On the other hand, Huxley's second wife, Laura Archera, would later emphasise in her biographical account, This Timeless Moment: "One of the great achievements of his life: that of having regained his sight." After revealing a letter she wrote to the Los Angeles Times disclaiming the label of Huxley as a "poor fellow who can hardly see" by Walter C. Alvarez, she tempered this: "Although I feel it was an injustice to treat Aldous as though he were blind, it is true there were many indications of his impaired vision. For instance, although Aldous did not wear glasses, he would quite often use a magnifying lens." Laura Huxley proceeded to elaborate a few nuances of inconsistency peculiar to Huxley's vision. Her account, in this respect, is discernibly congruent with the following sample of Huxley's own words from The Art of Seeing: "The most characteristic fact about the functioning of the total organism, or any part of the organism, is that it is not constant, but highly variable." Nevertheless, the topic of Huxley's eyesight continues to endure similar, significant controversy, regardless of how trivial a subject matter it might initially appear. American popular science author Steven Johnson, in his book Mind Wide Open, quotes Huxley about his difficulties with visual encoding: "I am and, for as long as I can remember, I have always been a poor visualizer. Words, even the pregnant words of poets, do not evoke pictures in my mind. No hypnagogic visions greet me on the verge of sleep. When I recall something, the memory does not present itself to me as a vividly seen event or object. By an effort of the will, I can evoke a not very vivid image of what happened yesterday afternoon ...". Huxley married Maria Nys (10 September 1899 – 12 February 1955), a Belgian he met at Garsington, Oxfordshire, in 1919. They had one child, Matthew Huxley (19 April 1920 – 10 February 2005), who had a career as an author, anthropologist, and prominent epidemiologist. In 1955, Maria Huxley died of cancer. In 1956, Huxley married Laura Archera (1911–2007), also an author, as well as a violinist and psychotherapist. She wrote This Timeless Moment, a biography of Huxley. She told the story of their marriage through Mary Ann Braubach's 2010 documentary, Huxley on Huxley. Huxley was diagnosed with laryngeal cancer in 1960; in the years that followed, with his health deteriorating, he wrote the Utopian novel Island, and gave lectures on "Human Potentialities" both at the University of California's San Francisco Medical Center and at the Esalen Institute. These lectures were fundamental to the beginning of the Human Potential Movement. Huxley was a close friend of Jiddu Krishnamurti and Rosalind Rajagopal and was involved in the creation of the Happy Valley School, now Besant Hill School of Happy Valley, in Ojai, California. The most substantial collection of Huxley's few remaining papers, following the destruction of most in a fire, is at the Library of the University of California, Los Angeles. Some are also at the Stanford University Libraries. On 9 April 1962, Huxley was informed he was elected Companion of Literature by the Royal Society of Literature, the senior literary organisation in Britain, and he accepted the title via letter on 28 April 1962. The correspondence between Huxley and the society are kept at the Cambridge University Library. The society invited Huxley to appear at a banquet and give a lecture at Somerset House, London in June 1963. Huxley wrote a draft of the speech he intended to give at the society; however, his deteriorating health meant he was not able to attend. On his deathbed, unable to speak owing to advanced laryngeal cancer, Huxley made a written request to his wife Laura for "LSD, 100 µg, intramuscular." According to her account of his death in This Timeless Moment, she obliged with an injection at 11:20 a.m. and a second dose an hour later; Huxley died aged 69, at 5:20 p.m. (Los Angeles time), on 22 November 1963. The championship trophy for badly timed death, though, goes to a pair of British writers. Aldous Huxley, the author of Brave New World, died the same day as C. S. Lewis, who wrote the Chronicles of Narnia series. Unfortunately for both of their legacies, that day was November 22, 1963, just as John Kennedy’s motorcade passed the Texas School Book Depository. 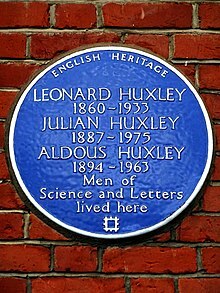 Huxley, at least, made it interesting: At his request, his wife shot him up with LSD a couple of hours before the end, and he tripped his way out of this world. This coincidence served as the basis for Peter Kreeft's book Between Heaven and Hell: A Dialog Somewhere Beyond Death with John F. Kennedy, C. S. Lewis, & Aldous Huxley, which imagines a conversation among the three men taking place in Purgatory following their deaths. Huxley's memorial service took place in London in December 1963; it was led by his elder brother Julian. On 27 October 1971 his ashes were interred in the family grave at the Watts Cemetery, home of the Watts Mortuary Chapel in Compton, Guildford, Surrey, England. Huxley had been a long-time friend of Russian composer Igor Stravinsky, who later dedicated his last orchestral composition to Huxley. Stravinsky began Variations in Santa Fé, New Mexico, in July 1963, and completed the composition in Hollywood on 28 October 1964. It was first performed in Chicago on 17 April 1965, by the Chicago Symphony Orchestra conducted by Robert Craft. 1959: American Academy of Arts and Letters Award of Merit (for Brave New World). "Some Reflections of the Lord's Prayer"
1942 "Reflections of the Lord's Prayer"
"Reflections of the Lord's Prayer II"
"The Magical and the Spiritual"
"A Note on the Bhagavatam"
1944 "On a Sentence From Shakespeare"
"The Philosophy of the Saints"
"The Nature of the Ground"
"The Nature of the Ground II"
1946 "Origins and Consequences of Some Contemporary Thought-Patterns"
1948 "Give Us This Day Our Daily Bread"
1950 "Foreword to an Essay on the Indian Philosophy of Peace"
1952 "A Note on Enlightenment"
1956 "Foreword to the Supreme Doctrine"
1957 "The 'Inanimate' is Alive"
1960 "Symbol and Immediate Experience"
^ Watt, Donald, ed. (1975). Aldous Huxley. Routledge. p. 366. ISBN 978-0-415-15915-9. Retrieved 10 April 2016. Inge's agreement with Huxley on several essential points indicates the respect Huxley's position commanded from some important philosophers … And now we have a book by Aldous Huxley, duly labelled The Perennial Philosophy. … He is now quite definitely a mystical philosopher. ^ Sion, Ronald T. (2010). Aldous Huxley and the Search for Meaning: A Study of the Eleven Novels. McFarland & Company, Inc. p. 2. ISBN 978-0-7864-4746-6. Retrieved 10 April 2016. Aldous Huxley, as a writer of fiction in the 20th century, willingly assumes the role of a modern philosopher-king or literary prophet by examining the essence of what it means to be human in the modern age. … Huxley was a prolific genius who was always searching throughout his life for an understanding of self and one's place within the universe. ^ Reiff, Raychel Haugrud (2010). Aldous Huxley: Brave New World. Marshall Cavendish Corporation. p. 7. ISBN 978-0-7614-4278-3. He was also a philosopher, mystic, social prophet, political thinker, and world traveler who had a detailed knowledge of music, medicine, science, technology, history, literature and Eastern religions. ^ Sawyer, Dana (2002). Aldous Huxley: A Biography. The Crossroad Publishing Company. p. 187. ISBN 978-0-8245-1987-2. Retrieved 10 April 2016. Huxley was a philosopher but his viewpoint was not determined by the intellect alone. He believed the rational mind could only speculate about truth and never find it directly. ^ "The Britons who made their mark on LA". 11 September 2011. ISSN 0307-1235. Retrieved 5 July 2018. ^ Thody, Philipe (1973). Huxley: A Biographical Introduction. Scribner. ISBN 978-0-289-70188-1. ^ David K. Dunaway (1995). Aldous Huxley Recollected: An Oral History. Rowman Altamira. p. 90. ISBN 978-0-7619-9065-9. ^ "Cornhill Magazine". National Library of Scotland. Retrieved 24 April 2016. ^ a b c Bedford, Sybille (1974). Aldous Huxley. Alfred A. Knopf / Harper & Row. ^ James Hull (2004). Aldous Huxley, Representative Man. LIT Verlag Münster. p. 6. ISBN 978-3-8258-7663-0. ^ M.C. Rintoul (5 March 2014). Dictionary of Real People and Places in Fiction. Taylor & Francis. p. 509. ISBN 978-1-136-11940-8. ^ Huxley, Aldous (1939). "Biography and bibliography (appendix)". After Many A Summer Dies The Swan. 1st Perennial Classic. Harper & Row. p. 243. ^ a b c Huxley, Aldous (2006). "Aldous Huxley: A Life of the Mind". Brave New World. Harper Perennial Modern Classics / HarperCollins Publishers. ^ Crick, Bernard (1992). George Orwell: A Life. London: Penguin Books. ISBN 978-0-14-014563-2. ^ Baggini, Julian (2009). Atheism. Sterling. p. 86. ISBN 978-1-4027-6882-8. ^ Weber, Michel (March 2005), Meckier, Jerome; Nugel, Bernfried (eds. ), "On Religiousness and Religion. Huxley's Reading of Whitehead's Religion in the Making in the Light of James' Varieties of Religious Experience", Aldous Huxley Annual. A Journal of Twentieth-Century Thought and Beyond, Münster: LIT, 5, pp. 117–32 . ^ Clark, Ronald W (1968), The Huxleys, London: William Heinemann . ^ Woodcock, George (2007). Dawn and the Darkest Hour: A Study of Aldous Huxley. Black Rose Books. p. 240. .
^ "Aldous Huxley". Peace Pledge Union. Archived from the original on 6 June 2011. Retrieved 15 May 2011. ^ "7 unproduced screenplays by famous intellectuals". Salon. 15 April 2010. Retrieved 25 February 2018. ^ Unwin, JD (1940), Hopousia or The Sexual and Economic Foundations of a New Society, NY: Oscar Piest . ^ Huxley, Aldous (1969). Grover Smith (ed.). Letters of Aldous Huxley. London: Chatto & Windus. ISBN 978-0-7011-1312-4. ^ "The Mike Wallace Interview: Aldous Huxley (18 May 1958)". YouTube. 25 July 2011. Retrieved 8 March 2013. ^ Raychel Haugrud Reiff (1 September 2009). Aldous Huxley: Brave New World. Marshall Cavendish. p. 31. ISBN 978-0-7614-4701-6. ^ Nicholas Murray (4 June 2009). Aldous Huxley: An English Intellectual. Little, Brown Book Group. p. 309. ISBN 978-0-7481-1231-9. ^ Isherwood, Christopher; Swami Prabhavananda; Aldous, Huxley (1987). Bhagavad Gita: The Song of God. Hollywood, Calif: Vedanta Press. ISBN 978-0-87481-043-1. ^ Michel Weber, " Perennial Truth and Perpetual Perishing. A. Huxley’s Worldview in the Light of A. N. Whitehead’s Process Philosophy of Time ", in Bernfried Nugel, Uwe Rasch and Gerhard Wagner (eds. ), Aldous Huxley, Man of Letters: Thinker, Critic and Artist, Proceedings of the Third International Aldous Huxley Symposium Riga 2004, Münster, LIT, "Human Potentialities", Band 9, 2007, pp. 31–45. 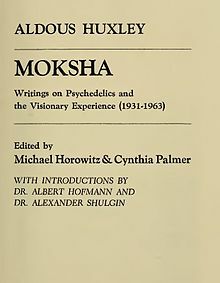 ^ Huxley, "Moksha: Aldous Huxley’s Classic Writings on Psychedelics and the Visionary Experience"
^ Nugel, Bernfried; Meckier, Jerome (28 February 2011). "A New Look at The Art of Seeing". Aldous Huxley Annual. LIT Verlag Münster. p. 111. ISBN 978-3-643-10450-2. ^ Cerf, Bennett (12 April 1952), The Saturday Review (column), quoted in Gardner, Martin (1957). Fads and Fallacies in the Name of Science. Dover Publications. ISBN 978-0-486-20394-2. ^ O Conselheiro Come (in Portuguese). Editora Nova Fronteira. 2000. p. 92. ISBN 978-85-209-1069-6. ^ Huxley, Laura (1968). This Timeless Moment. New York: Farrar, Straus & Giroux. ISBN 978-0-89087-968-9. ^ Rolfe, Lionel (1981) Literary LA p. 50. Chronicle Books, 1981. University of California. ^ Huxley, The Doors of Perception and Heaven and Hell, Harper Perennial, 1963, p. 15. ^ Johnson, Steven (2004). Mind Wide Open: Your Brain and the Neuroscience of Everyday Life. New York: Scribner. p. 235. ISBN 978-0-7432-4165-6. ^ Kripal, Jeffrey (2007). Esalen America and the Religion of No Religion. University of Chicago Press. excerpt. ^ "Finding Aid for the Aldous and Laura Huxley papers, 1925–2007". Special Collections, Charles E. Young Research Library, UCLA. Retrieved 4 October 2012. ^ "Guide to the Aldous Huxley Collection, 1922–1934". Dept. of Special Collections and University Archives. Retrieved 4 October 2012. ^ "Account of Huxley's death on Letters of Note". Lettersofnote.com. 25 March 2010. Retrieved 19 December 2011. ^ Kreeft, Peter (1982). Between Heaven and Hell: A Dialog Somewhere Beyond Death with John F. Kennedy, C. S. Lewis & Aldous Huxley. Downers Grove, IL: InterVarsity Press. p. back cover. ISBN 978-0-87784-389-4. On November 22, 1963, three great men died within hours of each other: C. S. Lewis, John F. Kennedy, and Aldous Huxley. All three believed, in different ways, that death is not the end of human life. Suppose they were right, and suppose they met after death. How might the conversation go? ^ Murray, Nicholas (2003). Aldous Huxley: A Biography. St. Martin's Press. p. 455. ISBN 978-0312302375. Retrieved 9 June 2017. ^ Wilson, Scott. Resting Places: The Burial Sites of More Than 14,000 Famous Persons, 3d ed. : 2 (Kindle Location 22888). McFarland & Company, Inc., Publishers. Kindle Edition. ^ Chevalier, Tracy (1997). Encyclopedia of the Essay. Routldge. p. 416. ISBN 978-1-57958-342-2. ^ Bradshaw, David (1993). "Introduction". Aldous Huxley's "Those Barren Leaves" (Vintage Classics, 2005). Vintage, Random House, 20 Vauxhall Brigade Road, London. xii. ^ "Eyeless in Gaza (TV Series 1971– )" – via www.imdb.com. ^ "Knowledge and Understanding". AllMusic. Retrieved 8 March 2013. ^ a b "Note on lecturing in Santa Barbara". Pooler-georgia-homepage.com. Archived from the original on 16 January 2013. Retrieved 8 March 2013. ^ "Who Are We?". AllMusic. Retrieved 8 March 2013. Anderson, Jack. 1982. "Ballet: Suzanne Farrell in 'Variations' Premiere". New York Times (4 July). Barnes, Clive. 1966. "Ballet: Still Another Balanchine-Stravinsky Pearl; City Troupe Performs in Premiere Here 'Variations' for Huxley at State Theater". New York Times (1 April): 28. Spies, Claudio. 1965. "Notes on Stravinsky's Variations". Perspectives of New Music 4, no. 1 (Fall-Winter): 62–74. Reprinted in Perspectives on Schoenberg and Stravinsky, revised edition, edited by Benjamin Boretz and Edward T. Cone, [pages]. New York:W. W. Norton, 1972. Bedford, Sybille (2002). Aldous Huxley: A Biography. Ivan R Dee. ISBN 978-1-56663-454-0. Braubach, Mary Ann (2010). "Huxley on Huxley". Cinedigm. Retrieved 25 September 2017. David King Dunaway, PH.D. (1991). Huxley in Hollywood. Anchor. ISBN 978-0-385-41591-0. Huxley, Aldous (1952). The Devils of Loudun (appendix). Rolo, Charles J. (ed.). The World of Aldous Huxley, Grosset Universal Library, 1947. Shaw, Jeffrey M. Illusions of Freedom: Thomas Merton and Jacques Ellul on Technology and the Human Condition. Eugene, OR: Wipf and Stock. 2014. ISBN 978-1-62564-058-1. Raymond Fraser, George Wickes (Spring 1960). 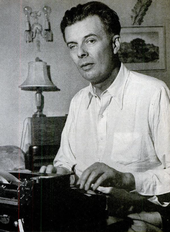 "Interview: Aldous Huxley: The Art of Fiction No. 24". The Paris Review.